Home English Actua & Analysis Call to all Belgian political parties: Stop the infiltration of Turkish fascism in your parties! 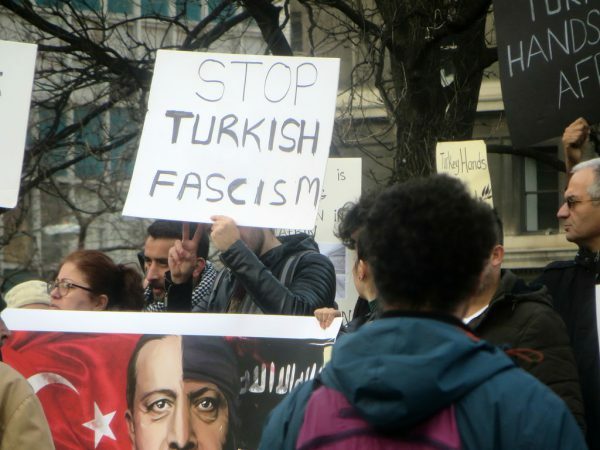 Call to all Belgian political parties: Stop the infiltration of Turkish fascism in your parties! In reference to the coming elections in Belgium on 14 October 2018, the Kurdish Institute pleads for all candidates who are running for a democratic party in Belgium, that they embrace democracy and human rights in our country, and in the home country. The Kurdish Institute has been warning Belgian politicians for many years for the danger of infiltration by dangerous organisations like the Grey Wolves, Diyanet and Milli Görüs, the Turkish Federation and and other ultra-nationalist figures in our Belgian parties. These figures, who clearly do not esteem very highly of democracy, but who believe deeply in a racist-fascist ideology, have managed to conquer some key positions in the unsuspecting political parties, institutions and general society. This ideology is build upon the foundation of authoritarianism and a strict orthodoxy, instead of pluralism and openness. They claim the Turkish identity and force their vision on everybody. They promote the worship of the conservative and islamic centres of power and the military. Dissidents, people with different lifestyles a.o. are shunned and marginalised. In recent articles we have already witnessed the schizophrenic attitude of these Turkish politicians. The hidden agenda of the AKP, the Grey Wolves and others, is exposed: communication towards the Flemish population contains surprising words like “multiculturalism” and “democracy”, but towards the Turkish voter they present themselves as loyal supporters of Erdogan and Bahceli, the two political leaders who are keeping ultra-nationalism and racism alive within the community and it’s diaspora. Indeed it are these politicians who infiltrate progressive parties, but in reality they maintain a ultra-nationalist and racist vision. These are politicians who do not believe in the democratic values of Belgium. The fact that such ideologies have been infiltrating politics slowly for many years, and the possibility that these people could influence policy, is a great concern to us. Their vision is at odds to dialogue, respecting the other, pluralism and democratic participation. The traditional Flemish and Belgian parties do not seem to have a policy to prevent this phenomenon. Our politicians are often still ignorant of the ideology and the corresponding agenda of Turkish ultra-nationalists, which originates from parties like the AKP and the MHP. But the question is wether this situation has developed out of sheer ignorance, or are things like opportunism and collecting votes also in play? The consequences, however, are that the Belgian and Flemish parties have helped acquiring the negative trends within the Belgian-Turkish community a bigger legitimacy. As a result, the democratic trends within the community are being suppressed. The credibility of Belgian politics is being damaged. Therefore, the Kurdish Institute urges the different political parties to be careful, and to have a policy that counters the phenomenon of infiltration. A clear sign is needed which states that racist and fascist ideas are not welcome. It is the responsibility of the Flemish and Belgian political organisations to ensure and maintain the democratic and freethinking trends within the community.